You've heard the word before, it's Comedogenic (ko-mead-dee-oh-jen-ick) that means... it causes acne! And what does irritating mean to you? We all know that relatives can be irritating. And even on some occasions, our closest friends. The IRS is especially irritating. However, we are talking about ingredients that irritate your skin! The hallmarks of skin irritation are...hives, redness, swelling, flaking, peeling, itching and general crabbiness from the above-mentioned conditions. Traffic is irritating...it causes road rage. Irritating ingredients cause skin rage! Did you know that there are comedogenic and irritating ingredients in everyday cosmetics, medications, makeup, sunblocks, shaving creams, hair care and skin care products? It's true! DO THE INGREDIENTS IN YOUR PRODUCTS CAUSE ACNE? 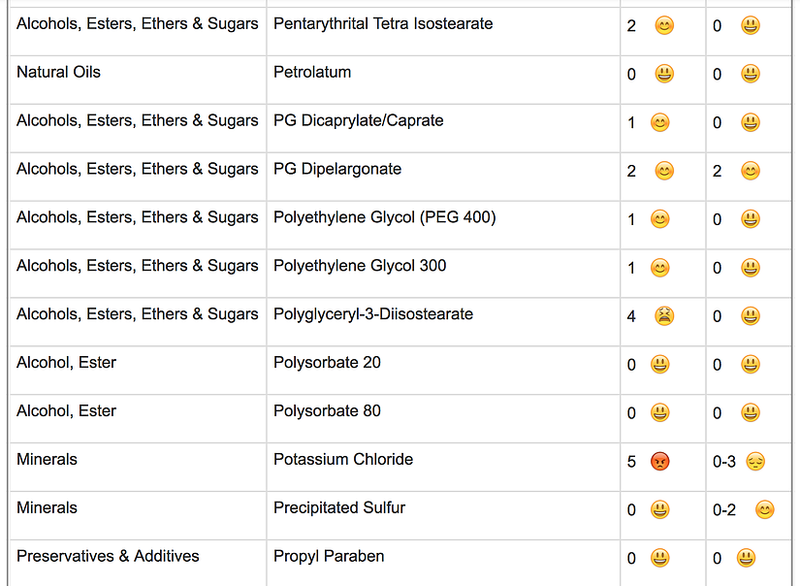 Check the ingredients on your labels on the Sage Advice Database of comedogenic and irritating ingredients (below) to find out if an ingredient is good or bad for your skin! Almost all cosmetic manufacturers tell you that their products are non-comedogenic (non-acne causing) because they want to sell you their products. The unsuspecting consumer purchases these products because the labels state that the product is good for you and will help you to get rid of all of the "ZITS", scarring, discoloration, etc. that you have. The sad fact is that as long as these ingredients are used in skin care products, sunblocks, shaving creams, hair products, makeup and products to "clear" acne, the longer the individual who uses them will have active acne. We know that acne is inherited from your parents. It may be also be worsened or caused (those who did not inherit the gene) by cosmetics, stress, hormonal fluctuations, medications, certain vitamins such as iodine, the sun and by the very products which are supposed to clear or cure the problem. Make sure that the individual "selling" you the products can pronounce the ingredients listed on the label. Make sure that the individual "selling" you the products can tell you what these ingredients do for and to your skin! For example: Isopropyl Myristate makes products feel creamy and it causes grade one and grade two cosmetic acne. Does the individual know the difference between a cosmetic and a drug? DRUGS may penetrate the surface of the skin and must be prescribed by a physician unless approved for over the counter sales. For example, Retina is a drug. It penetrates all layers of the skin and it must be prescribed by a physician. However, Hydrocortisone (under 1%) and Benzoyl Peroxide (10% and under) are also drugs, but they may be purchased over the counter. COSMETICS work on the surface of the skin and they do not penetrate all the layers of the skin. Can this individual explain the structure and function of your skin to you and how particular products will help or hinder your skin type? -- If you are dry and use a cream moisturizer, your skin will still be dry (dehydrated) underneath and greasy on the surface! -- If you are oily and use a cream moisturizer, you will still be dry underneath and very greasy on the surface! -- If you have acne and use a cream moisturizer, you will still be dry underneath, you will be able to slide down the road on your face AND you will have tons of new zits as well! Lanolin Oil confuses many individuals. Natural Lanolin Oil comes from the wool of a sheep and does not cause acne. Synthetic Lanolins (man-made) do cause acne and leave you feeling very oily! Below is a list which we recommend that you use to become an ACNE DETECTIVE and check ingredients yourself, no matter what the label states or implies! You will need to use this list patiently and search for the strange names of the ingredients on your containers. The reward is simple: No More Zits. This list will help you to make informed and intelligent decisions about what you choose to use on your skin. Remember that the first rule of thumb for any consumer is to be informed. 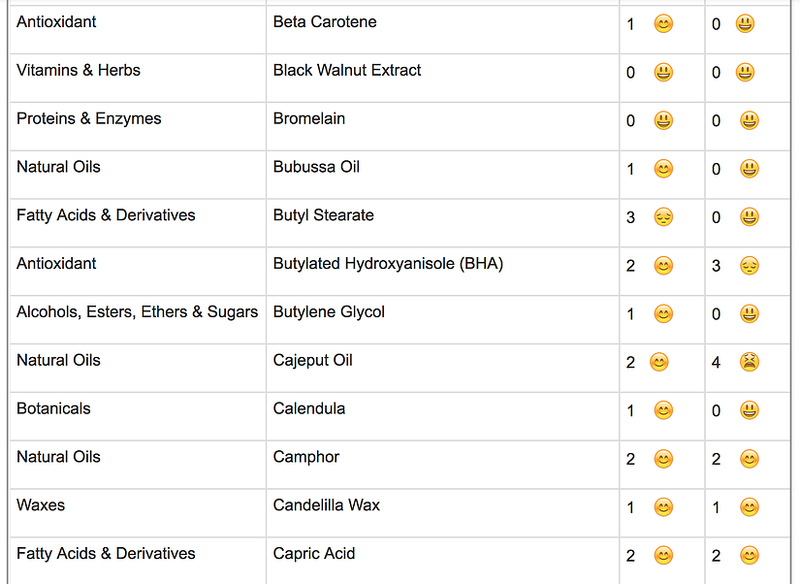 Print this list out and take it with you when you shop for products. If the ingredient is not on the list - it is safe. Barbara Strickland 1998-2016. This information is published and may not be reprinted.